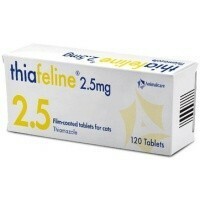 Thiafeline 2.5mg Tablets are indicated for the long-term treatment of feline hyperthroidism and for the stabilisation of hyperthyroidism in cats prior to surgical thyroidectomy. Each tablet contains 2.5mg thiamazole. These have worked for my 15 year old Tabby who has been diagnosed with mildly overactive thyroid and malabsorbtion. The vidalta meds my vet first tried made her vomit, and she seems to tolerate Thiafeline more.